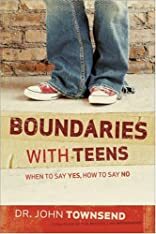 Boundaries With Teens: When to Say Yes, How to Say No was written by Dr. John Townsend and John Townsend. Boundaries With Teens: When to Say Yes, How to Say No was published by Zonderkidz. A subject of Boundaries With Teens: When to Say Yes, How to Say No is Religion.